Last weekend I began a new cookbook project. After finishing several recipes from the Herbfarm Cookbook, I decided to start another one. 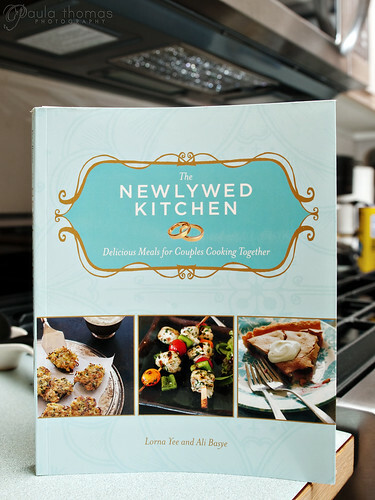 Lorna Yee and Ali Basye's Newlywed Kitchen Cookbook is the next cookbook that jumped out at me. The plan is to make 2 recipes from each section. Lorna has given me a nice list of her favorites to help me decide which ones to try. Mark is also going to help me out. There's 7 categories so I should have 14 recipes done by the end of the project and will post a summary and review of the cookbook when I'm finished. The first section is titled "Carry Me Over the Threshold" and consists of starters and snacks. 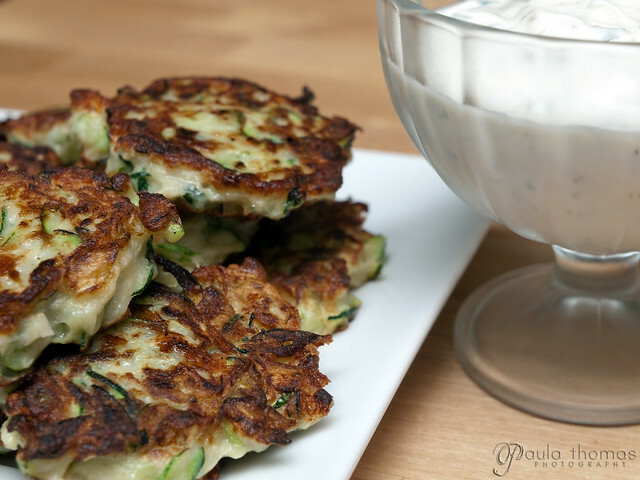 Since I still have a crap ton of zucchini from my garden, I thought the zucchini fritters would be a good choice and were even one of the recipes Lorna said was a fav of hers. 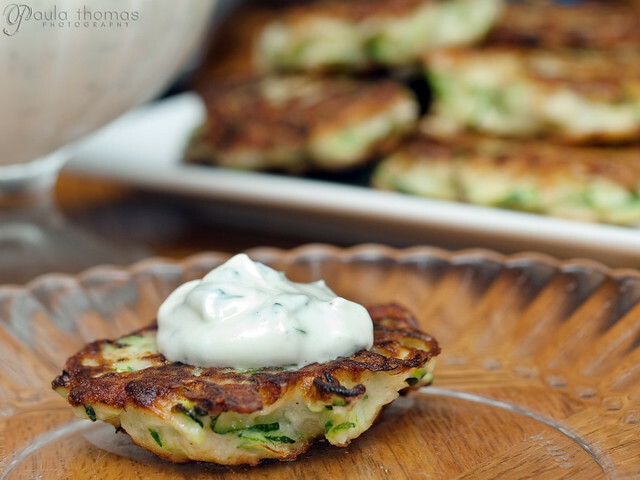 I already had all the ingredients to make the fritters and only had to pick up some yogurt and parsley for the sauce. 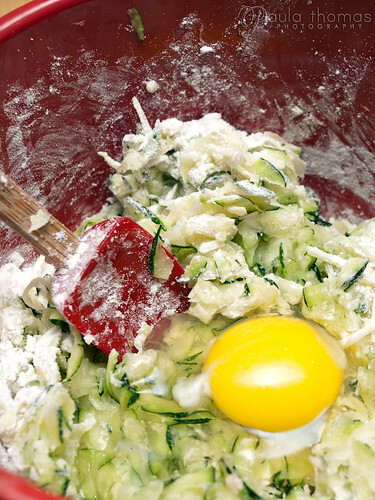 The fritter recipe was very simple and easy to follow, just dump everything into a bowl and and stir. 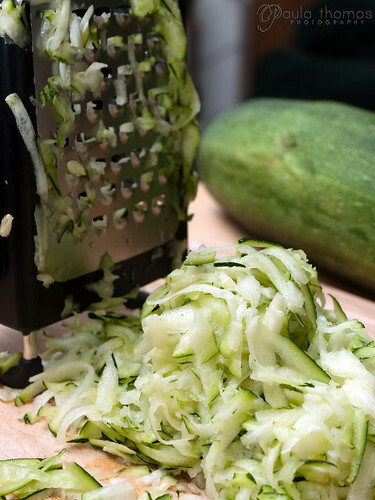 The recipe calls for 3 cups of shredded (2 large) zucchini. Well I accidentally let some of my zucchinis get gigantuan and ended up only using half of one zucchini to get 3 cups. It was really insanely huge. Since it was so big the seeds were getting to the rather large point so I scooped out the insides. The sauce was also just as easy to make and it went well with the fritters. It was even better topped with some of Secret Stash Salt's Vanilla Sea Salt. I wasn't sure how it would taste but I always like to experiment with sprinkling some sea salt on things and it was an amazing combination. I am looking forward to trying more of the recipes in this cookbook. These look tasty AND healthy!! I'm definitely going to try this recipe!! Thanks, Paula!